The largest of all fires to occur in Charlotte took place during the Civil War. On Jan. 7, 1864, the Confederate Depot and Ammunition Warehouse was obliterated after being torched. No one died in the incident. A significant one took place in the winter of 1891 and includes the fire engine you mentioned in your question. Known as a Jeffers Hand Pump Engine, it was manufactured in 1864 and purchased by the city in 1866. The last fire it fought occurred at The Belmont Hotel. Records prior to the blaze are fragmentary, but it appears it was the worst public-facility fire the city had experienced up to that time. Adding to the challenge of the blaze was the temperature that evening, which was near zero. The largest of all fires to occur in the city took place during the Civil War. On Jan. 7, 1864, the Confederate Depot and Ammunition Warehouse was obliterated after being torched. No one died in the incident. 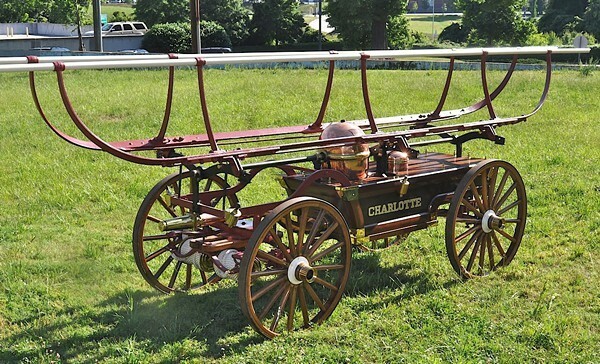 This 1864 Jeffers Hand Pump Fire Engine was the first piece of fire-fighting equipment ever used by Charlotte. From a report of the time: "After fighting most of the night, firemen had to cut away the ice, which had formed on the front of the building, in order to get at the flames beneath. All through the day and far into the second night the [firemen] and other volunteers fought to subdue the flames." The fire destroyed the hotel and resulted in the deaths of three people: the woman who reportedly overturned a lamp that started the fire (she was burned to death), a man who was injured at the scene and later died from sustained injuries, and a fireman, who perished at the hands of a coworker. According to the report, in what one could only infer was a practical joke, the fireman died after smashing an egg in the pocket of another fireman, who then pulled out a pocket knife and stabbed him in the jugular vein, resulting in one of the worst cases of overreaction in history, and his unfortuante demise. Later, on a cold December morning in 1922, the six-story Trust Building (at 212 S. Tryon St., since replaced by the Johnston Building) was almost completely burned, as was a three-story building next door. Among the businesses destroyed were the Academy of Music and Brockmann's Book Store. No one died. The largest fire in 20th century Charlotte took place on June 24, 1954 at the Southern Railway Freight Station. The two block-long building once stretched from Second to Fourth streets, between College and Brevard. It was an important distribution hub for the city - nearly all the goods sold at the time passed through this station. Press of the day reported the following from fireman W.O. Dowdy, who would later become chief: "The streets were thick with people. I don't know how they withstood the heat. It was hot enough to raise blisters. It set cars parked next to the building on fire." Smoke from the massive blaze rose nearly two miles into the sky and could be seen as far away as Columbia, S.C. The fire was eventually contained, and the city was left without a freight station for a time - but again, no reported deaths. Other fires have impacted the Queen City to varying degrees. The former Armory auditorium (now the Grady Cole Center at 310 Kings Dr.) burned in June 1954, leaving the city without a major performance venue until the Charlotte Coliseum opened the following year. A tremendous chemical fire in September 1982 at a downtown warehouse released toxic gases into the atmosphere, requiring the evacuation of thousands in the 12-mile radius around the facility. The Charlotte Fire Department currently has several of their historic engines in storage (including the Jeffers Hand Pump). Although the former Fire History Museum, on Fifth Street, was forced to close, they can still be viewed by appointment at a fire department facility on 26th Street. Call 704-336-7174 for more information. "Question the Queen City: Burn, baby, burn! ", David Aaron Moore, Creative Loafing Charlotte, June 13, 2014.